Pyrus pumila.Arthur Haines.New England Wild Flower Society.gobotany.newenglandwild.org. (Accessed 9/2014). Pyrus pumila is a small tree to 15 m tall, buds hairy, young twigs wooly-hairy. Leaves alternate, elliptic, to 10 x 5.5 cm, tip pointed, margin toothed, hairy below, leaf stalks hairy, stout, to 3 cm long. Flowers pinkish-white, calyx wooly-hairy, styles, hairy above. Fruit fleshy with cartilaginous, seedy core, round, 2 cm wide or more, impressed at top and base, calyx persistent, stalk hairy. 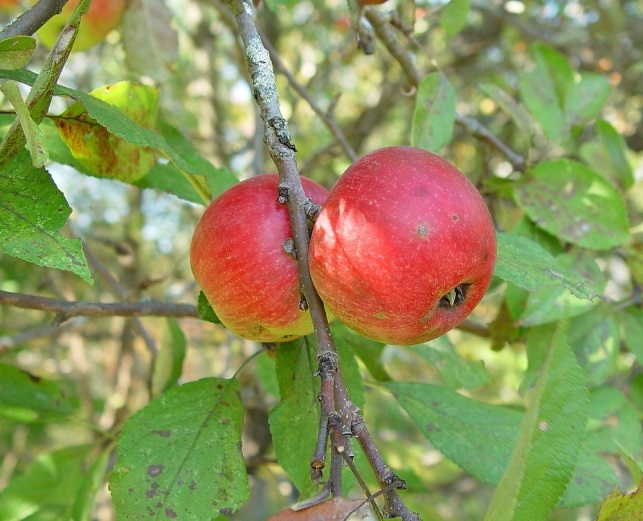 Parent species of some cultivated apples. Habitat: Not often naturalized. More often encountered in overgrown orchards or house sites.